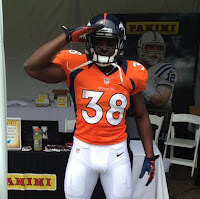 In his post-draft press conference last month, new Denver Broncos running back Montee Ball beamed with excitement over joining the team after following the franchise as a child. According to Ball, his favorite player growing up was former Broncos running back Terrell Davis. “The Broncos have been my favorite team ever since I started watching football," Ball said in April. As it turns out, Ball has photographic evidence. Ball participated in the 2013 Rookie Premiere over the weekend, giving fans a first look at what he will look like in orange and blue. Ball has already picked up on the 'Mile High Salute," a sure confirmation that Ball grew up watching Davis, who made the salute popular in the 1990s.